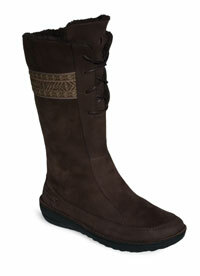 Teva says:"For those days when the sun just refuses to come out we have the Kiru Boot. The Kiru Boot's beautiful waterproof leather upper is lined by a super soft faux fur lining to keep your feet feeling warm and comfortable all day long." The Kiru Boots from Teva are a great looking, light-weight, full length boot. With their leather upper, faux-fur lining, and padded inner sole, they were warm and extremely comfortable straight from the box. The sizing is definitely on the small side - I needed a full size bigger than I would normally take in a walking boot. The fitting around my calf, however, was fine - there is lacing for any fine adjustment. There is no arch support as such - this was not a problem for me as I do always use my own orthotics - but may be an issue for some. Nontheless, I have been extremely comfortable wearing the Kirus for some quite extended periods of time in light rain and when walking through wet grass; my feet have been warm, dry and comfortable throughout. More recently, though, I've been wearing them in deep, slushy snow - and sadly I've discovered some leakage around the seams at the front of the foot. The traction on wet grass and mud was surprisingly good - also quite good on snow. The Kirus are what I would describe as an 'apres-hill boot'. They are a supremely comfortable and warm boot - perfect for slipping into after a cold day out on the hills. Having said that though, they are also fine for short, low level forest or canal-side walks in cold, dry weather ... and absolutely great for more general leisure use thoughout the winter if you want footwear that is a lot more functional than the standard high street offering. Do check the sizing.